Dr Claire Hayes, Clinical Director of Aware offers some advice for parents and teachers and how to identify the signs of depression. The suicide rates of teenagers in Ireland remains high by global standards and continues unabated. Treatment is available for depression and seeking support from a G.P. and/or a mental health professional e.g. Psychotherapist is essential to obtain a correct diagnosis. Dr Hayes “six tips” to help children and adolescents is a very pragmatic resource for both parents and teachers. Read the full article here. 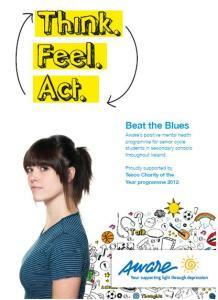 ‘Beat the Blues’ – Aware’s informative toolkit designed to help adolescents and most importantly develop resilience and instill hope – visit Aware for more information.